Before cutting-edge consoles were mainstream in every living room, the only way to play the latest cool titles was down an arcade which usually involved a dark dingy room which was lit-up by rows of cabinets. But now you can bring all of the joystick joy straight to your mobile with Arcade Spins. With an 8-bit retro theme and the use of some clever neon graphics, it really gives you that classic retro experience. So let’s insert a coin and get playing! You can level-up from your first deposit at Arcade Spins. New players can take advantage of 25 wager-free bonus spins when you deposit £10. Make sure you use the Arcade Spins bonus code to qualify for the welcome bonus. In true arcade style you can join the Arcade Loyalty Leaderboard and win some incredible prizes as you level up. 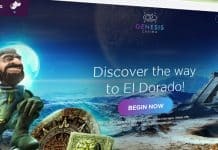 With no wagering daily free spins, cashback and VIP perks available to win. Arcade Spins boast having over 300+ slot titles at their disposal with some old favourites such as the gem-tastic classics Starburst, to the hilarious Doctor Love: On vacation or the terrifying but surreal Bloodshot. One thing I wasn’t impressed with was being unable to scroll through Arcade Slots selection of games, players would need to sign-up to see the full list. Although it’s not a show stopper it’s damn frustrating not being able to see their full catalogue of games without joining. 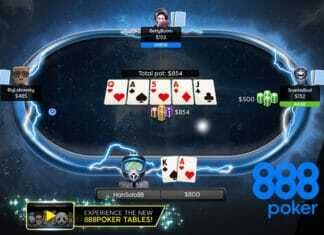 What became a frustrating feature of Arcade Spins was the lack of a navigation menu at the top of the page. This meant that everything was hidden either at the bottom of the homepage or unavailable to the user. 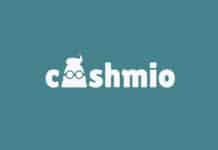 Something as simple as a promotions page which gave a detailed description of each of the offers could not be found if you were a guest just browsing the site. Aside from this the site worked pretty well on both mobile and tablet. The bonuses displayed were bold enough to read and the tiled games on the homepage were a decent size. Switching between horizontal to vertical view on a tablet was effortless and overall it was a pleasure to use on any mobile device. UX was particularly impressive, even on older mobile devices. Both user touch responsiveness was well dampened so not to be over reactive and the scroll feature on the games list allowed you to easily flick through to find the game your trying to find. The search bar was also a nice little feature allowing you to quickly search for a particular title. In all, the whole user experience was a dream from the moment you open the homepage and should be used as a template for other sites to follow. 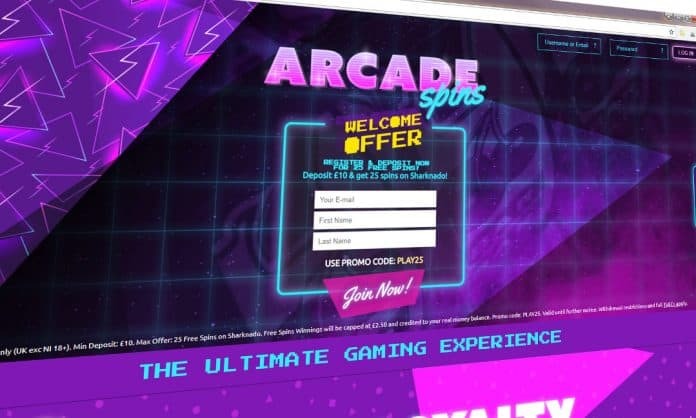 As you would expect Arcade Spins offers a variety of payment options which include the following: Paypal, Paysafe card, Neteller, VISA, Mastercard and Entropay. It’s a shame they didn’t offer some of the latest payment options such as Apple Pay or Android Pay which avoids you having to enter your credit card details, but hey you can’t have everything. Being a huge retro gamer I really enjoyed the nostalgia feel of Arcade Spins. 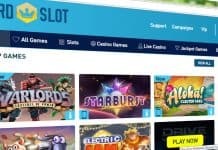 I was incredibly impressed with their 25 wager free spins bonus which only a handful of casino/slot sites offer and the random games selector is a nice little quirk for those who can’t decide what to play. There are a couple of snags such as the inability to scroll through their games list without registering first, which is always a bug-bear of mine. But don’t let this deter you as I completely loved the whole 80’s tron-style neon theme and overall experience of the site. 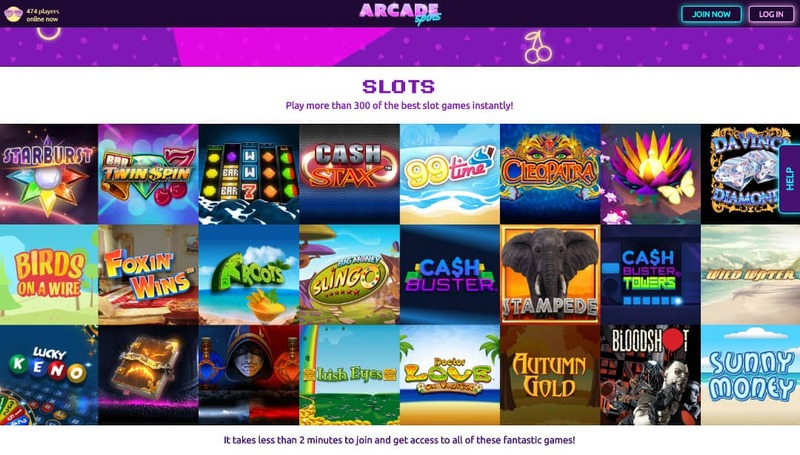 If you’re looking for a slots site with fresh and new ideas you con’t go wrong with Arcade Spins.